If you watched Captain Dugan’s keynote address at the opening ceremony of FDIC 2011 that I have posted below then you already know what this post is going to talk about and the chart above makes sense to you. If you have not heard the keynote address, take 22 minutes and go below to watch it then come back and you will understand. Don’t worry, we’ll still be here when you get back. Every year Bobby Halton and his staff bust their butts to put on the best gathering of fire department professionals in the world. And every year they kick off FDIC with a featured speaker to set the tone and get everyone both pumped up and thinking about what the fire service is. This year was no exception. Captain Dugan gave a great speech and hit on some very poignant topics in todays fire service. I would like to focus on one small section of his overall address in this post, the 1-percenter. While I enjoyed Captain Dugan’s entire speech this one section really got me thinking. It got me thinking about what I perceive myself as, what I perceive others as and what is really correct. You see, I perceive myself as a 1-percenter. I think that I strive to give back to the fire service and our younger members coming up behind us. I think that I train hard, educate myself above and beyond what is required and try to make myself the best overall firefighter and paramedic that I can. But that’s my perception. We’re all biased when evaluating ourselves, right? So what do others think of me? I guess it depends on who you would ask. I know that it might be hard for some of you to believe but I’m not universally loved and adored like I feel I should be (kidding, of course). I think that if you were to ask the numerous younger guys I have had a hand in training they would probably say some complimentary things about me and that we get along fine. If you were to ask some of the older members I work with you would get a few of those same opinions but you would also get the not-so-complimentary ones also. Some along the lines of, “trouble-maker”, “pot-stirrer”, maybe even “cocky” or the ever popular “he should just keep his mouth shut.” Problem is, that is exactly what Captain Dugan is talking about. If everyone just kept their mouths shut and went along with what was “normal” and the status quo then the picture we saw outside our windshields in 10 years would look awfully similar to the one we are looking at today. What’s our famous fire service motto? “One hundred years of tradition unimpeded by progress.” We all kind of chortle when we hear that but the sad truth is, it’s a fair and accurate statement in a lot of ways. Here’s the one problem I see with Captain Dugan’s analogy; everyone thinks they are a 1-percenter. Think about that for a second, hold it in your brain and read on. Think of the crustiest, most ornery member on your job. He or she probably thinks they are a 1-percenter. That person probably sees younger members coming up with college degrees, better training, perhaps a more “go get ’em” attitude and thinks that they are the problem with today’s fire service. If everyone had the experience that he or she had, if they had grown up in the school of hard-knocks old-time firefightin’ that they had they’d be real firefighters. They view themselves as the guardians of the old school and they view themselves as 1-percenters in their own way. On the flip-side we have the younger guys. The younger guys that do have college degrees, that do have better training, that are in a more enthusiastic and go get ’em phase of their careers and they view themselves as the 1-percenters. The officer that “leads” the way that he was “led”, even though it was really managing and they have no idea what the difference between the two is, thinks of themselves as a 1-percenter because he or she is doing it “right”, by the book, with a heavy hand and an un-waivering attitude. These new officers who actually talk to their charges and even more importantly listen to them and maybe even <gasp> ask for and consider other opinions are just weak and have no idea what they are doing. The chiefs that guide their departments down the same narrow road that they have been on forever view themselves as 1-percenters too. They are protecting the institution while everyone else is, in their opinion, trying to tear it down. Now, please, do not confuse buying new equipment, turnout gear and building new stations as “progress”. Those are things you absolutely have to do, they are not leading. Constantly reviewing your SOG’s and drafting new ones to fit new issues and developments within your response area, updating others that might be behind the times, looking at new technology and making it work the best for you instead of complaining about new mandates and resisting them for as long as possible, constantly looking for ways to improve the delivery of our services to the people we serve, that’s what I consider to be a 1-percenter. Not someone who looks over at the SOG book that was drafted when they were a firefighter and says, “Yep, it’s good. We have SOG’s and they must be fine because they were when I had to follow them.” Do you see what I mean? Everyone, somehow, someway, identifies themselves as a 1-percenter. So what about the rest of the pie? We’ve got that 10 out of 100 that just shouldn’t be here. And I am a firm believer in that. One of my favorite sayings is, “I may want to be a brain surgeon with every ounce of my being, but God just didn’t make me to be one. Does that mean I should be given a scalpel and free reign in an operating room?” Believe me, if you want to live, the answer would be a resounding “No”. So why do we pass firefighters on probation that are marginal at best? Why do we allow firefighters that made it through probation and are less than stellar to be buried at slower stations or to skip out on responsibilities? I once heard a senior firefighter with years of great experience and strong job knowledge say, “I don’t need to teach these young guys anything. It’s not my job. I’m just trying to get through these last few years.” I have no problem with someone a few years from retirement being afforded some extra latitude in certain things but passing on your knowledge and experience is not one that is negotiable in my book. If that’s the kind of poisonous attitude you are going to have then maybe you should just go now. What about those not physically capable of doing the job? They put themselves and the rest of us at risk. While a yearly NFPA medical physical is great and I’m all for them I don’t put a lot of stock in them for actual “job readiness” or as my buddy Chris Brennan would say “the ready position.” If you pass your annual medical physical but then cannot physically make it through the SCBA entanglement maze during training, which is more important? Maybe it’s time to go. 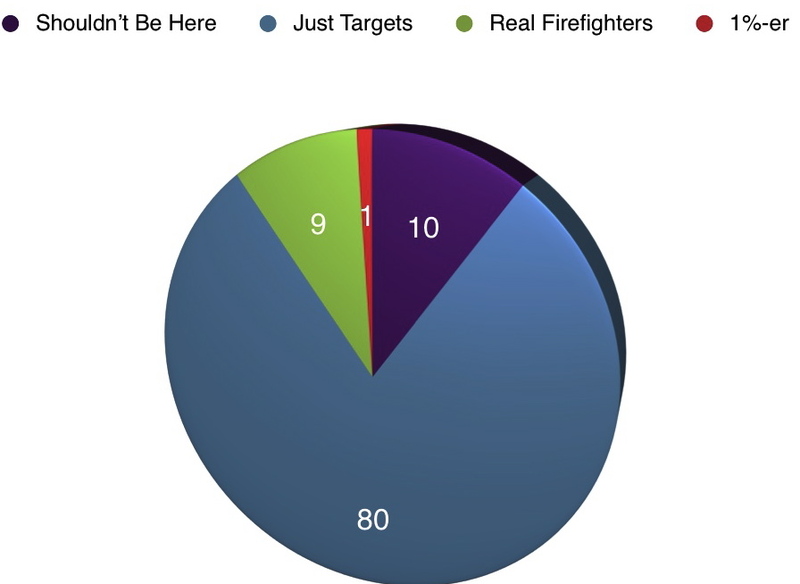 Then there’s the 80 out of 100 that are “just targets”, maybe for our purposes we should say the 80 that are “just here.” Those guys and gals that aren’t bad firefighters or medics, they aren’t bad guys and gals, they can physically do the job but they kind of just take up space in the house and on the rigs. I don’t necessarily have a huge problem with these folks. While I certainly would like to see everyone reading extra articles, taking classes, working on extra drills and making themselves better I know that not everyone will be like that. There is the regular Army and then there are the Rangers. There is the Navy and then there are the SEALs. There are Marines and then there are Recon Marines. There’s the Air Force and then there is Pararescue. Not everyone can be in that elite field. As long as you have strong firefighting knowledge and skills, strong paramedic knowledge and can carry out your job correctly and efficiently with the most basic of direction, then you’re ok in my book. Just ok, but still ok.
Then we have the 9 out of the 100. The real firefighters. Who is in this group? These are the people who started out as the 80 and pushed themselves to be better. These are the people who love the job and can’t get enough. Most of the time these are the people you see taking classes for other reasons than just promotion. People who join specialty teams or seek assignment to the busier companies and houses. Most of the time they are the people who have their heads in trade journals and websites finding out what’s new and hot. They strive to make themselves better and see their profession as much more than just a job, it’s a calling. They are a wealth of knowledge and share it freely. They are enthusiastic and rarely have a bad day at the firehouse. Some call them “geeks” or say they just shouldn’t care so much. But they know better. Then there’s the 1 in 100. The 1-percenter. This is the person that was a “real firefighter” and through a combination of hard work, dedication, training and pure God-given talent took their performance to a whole different level. These are the Olympic athletes of the fire service. Those firefighters and fire officers that just have that something extra that puts them above the rest of us. These are the true 1-percenters. I said in the opening I believe I am a 1-percenter, but I say it in the way that my first few paragraphs of this post were talking about. I perceive myself that way, but am I really? I don’t think so. I have so much more to learn and so much better that I can be. So while I strive to get there someday, I need to keep in mind that I could slip into another of these categories if I’m not careful. If I let too many set-backs take their toll, or too many perceived injustices quash my spirit. Continuing on the athletic example, I may strive for the Olympics but if I only get to the Major Leagues then I’m still better than 90% of those that try out. I’m pretty good with that. So do you see the dilemma? Everyone who cares the least little bit about the fire service will place themselves in the 9% or 1% categories. That’s their self-perception. As viewed by others, however, maybe not so much. So what should we do? Should there be an NFPA standard to define what category you fall into? What would it matter? Our departments would just opt out of that one just like they do half the others that they don’t want to follow. Should an independent certification board be set up and then you could earn your “1% Card”? I dunno. You can probably tell I’m suggesting that with my tongue firmly planted in my cheek. Maybe we should all just move on as we are. Let those that think they are in the top 10% keep thinking it. Let them also keep their negative attitudes of those of us that are actually striving to be in that top 10% and then raise a glass in their honor at their retirement parties. Meanwhile we do exactly what I just said. Keep striving to be in that top 10% while aiming towards being a true 1-percenter. Keep striving to bring positive and meaningful change to our beloved fire service and keep training up those that will follow in our footsteps. This entry was posted in Personal, Professional and tagged 1-Percenter, Bobby Halton, Chris Brennan, FDIC, Fire Department Instructor's Conference, Keynote Address, Mike Dugan. 1%er is my middle name! While we are not looked upon well by those who are in our profession for the days off or the paycheck, we need to push forward. Maybe just maybe we can influence just one member and bring them into the 1%er fold. You make a good point that everyone thinks of themself as a 1%er. My goal is to become a 1%er, but would never make that declaration. I can proudly and truthfully say that I fall into the 9% catagory. I think that only 9%ers can truely proclaim a peer to be a 1%er. It is no different than a Brothers name coming up in conversation and someone says “That my friend; is a Fireman” The 1%er is the guy the 9%er looks up to. I have had the pleasure to work along side several 1%ers. Many never achieved rank by their own accord because they knew their place was to lead and make a difference in the best job in the world from within. Raise a glass lads; to the 1%ers who save the asses of the 10%ers, try to make the 80%ers better and give us 9%ers someone learn from. This article has proved to be a real pot stirrer in my Department.I copied it and put it up in our watch office. It seems some people have taken offense to it. Our Chief thinks this was put up as a direct attack on him!! I thought it would provoke looking at ones self and how much we put into our profession. I guess I just have to sit back and laugh. If these people are so offended by this what percent do they fall into? Um, I’m sorry? I dunno Jason, maybe it goes to prove the point of the article. Maybe it just shows the insecurity people have about their own job knowledge and performance. I, like you, would think reading this or a similar article would spark some introspection and evaluation. Sadly I think that is not the norm. I think today the norm is to automatically get defensive and refuse to accept criticism or blame. Reach who we can reach, influence those we can influence and show the right path to those we can train. Keep the faith, brother.